Oh hello. What did I find when I popped into M&S to purchase a humble wholemeal roll to go with my soup yesterday? What's that? 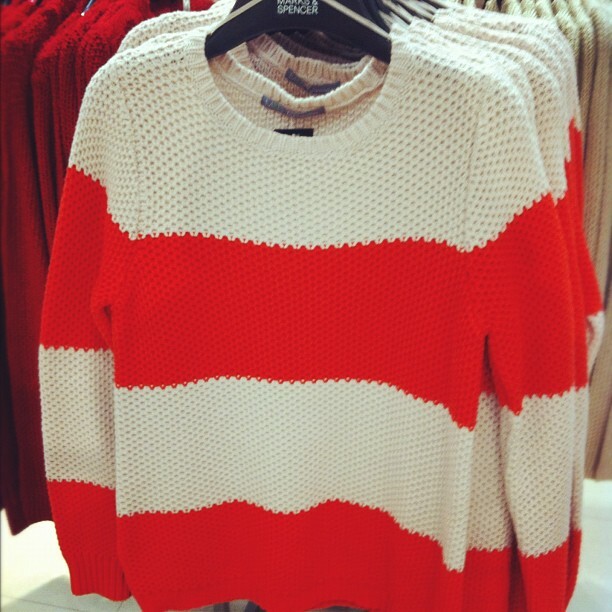 Knitwear? And stripes too? Yes please. Nothing says Christmas like a new piece of knitwear, and I love this nautical number, which comes in navy and white. But my preferred colour is the beige and orange version - it's 100% cotton, and I think it looks a bit more Whistles than M&S. Pair it with your skinny or straight-leg jeans, or a slim pair of navy trousers. I'll be stalking this one after Christmas, to see if it goes into the sale, and when it does, don't you worry, I will pounce.